Thanks so much to everyone who left comments on the previous post. As you can see from the photo, my little bump in the road got a bit bigger and I am writing this from a hospital bed. Shortly after I published the previous post, I got a phone call from Dr. Shaw with the results from the local lab. My liver enzymes, rather than going down, had now risen to more than four times their level on Monday. Essentially, my liver was being poisoned. There isn’t an antidote for hepatotoxicity, but Alice (Dr. Shaw) wanted me to come in for monitoring. Significantly elevated liver enzymes (ALT/SGPT and AST/SGOT) are a sign that rapid cell death or injury to the liver has occurred (as the cells die they lyse, or break apart, and release enzymes into the blood stream). However, even a severely injured liver can maintain function. My circulating levels of bilirubin and alkaline phosphatase were both within normal limits, which was reassuring. In the case of actual liver malfunction, they would be elevated as well. However, should the ALT/AST continue to rise, function could be affected as well. So, off to the hospital I went. Initially I was assigned to a double in an acute care wing. Dr. Shaw checked in and then it was time for some tests. Around 10 pm my liver enzymes were tested once again and they were slightly lower than the one that morning but still quite high. I had a chest x-ray as I was still coughing (and the levaquin was now being held as well) but it came back clear for pneumonia. I was poked and prodded and asked if it hurt until it finally did. I was given an ultrasound of my abdomen, which showed no lesions (thank goodness for that). And, just to rule out anything else that could have instigated the elevation, I was tested for everything under the sun that could affect liver enzymes. Hepatitis, HIV, Epstein-Barr, drugs and alcohol (just in case the patient wasn’t disclosing!). 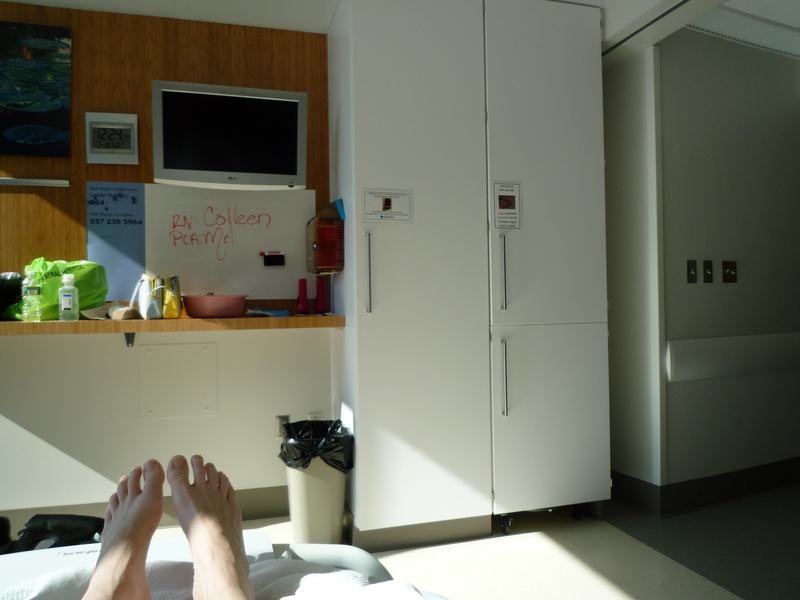 My roommate was a lovely woman, but anything other than a private room in the hospital is just really hard. Two people, both sick but generally not in the same way, a shared bathroom and a very modest space full of apparatus that is often beeping loudly, a parade of doctors, nurses and visitors as well as the inability to not hear everything that is being said and happening on the other side of the curtain which divided us. It is really not conducive to sleep or healing. Fortunately, by late Friday, a room had opened in the Lunder building. It is a new wing of Massuchetts General Hospital which is devoted to cancer patients. It is located directly adjacent to the Yawkey center, where I receive my outpatient care. All the rooms are private, spare and modern and graced with large windows as well as pull out couches for visitors. It’s really nice. So, that’s where I’ve been hanging out. Aside from a twelve hour period of diarrhea (unrelated to the liver, so more tests) I have felt under the weather, but not too bad. Each day my enzymes have been a bit lower; at first the change was incremental, but the downward pace is increasing. My appetite is coming back as well, and I’m starting to feel restless (a good sign). It’s now Sunday. Half an hour ago I was handed my discharge papers. My ALT is still in the triple digits, but at this rate, I should be back to normal soon. Once home, I will resume the levaquin (now felt safe to reintroduce) as my chest infection has lingered. On Tuesday I’ll be back in Boston for more labs, a chest CT scan and a quick meeting with Alice. The big question will be, where do we go from here? This entry was posted in LDK 378 and tagged elevated liver enzymes, hepatotoxicity, LKD 378. Bookmark the permalink. Linnea,… sigh… glad you’re on the mend. just a thought? i’ll be at MGH on Tues. getting my 3 month scan and lab work(remember we connected in the waiting room for another scan) my scan is scheduled for 10:50. (I can be there earlier) Anyhow if you want a smiling face visit, let me know, and if possible I’ll be there. Much thought and prayers sent your way. Cheryl, my first appt. that day is at 10 am. I am supposed to see Dr. Shaw at 10:30 (but you know that often runs late) and then have a scan at 2:00–so I would have time either before my first appt. or after the meeting with Dr. Shaw. I also could just meet up with you in the waiting room on 7E–so let me know what would work for you. In other words, yes! I will see you tomorrow. I’ll make sure to follow your schedule and we will meet up at some point. Either on 6E or 7E. I only have my scan and blood work, no Dr. appt. till next week. I’ll let the folks there know I;m looking for you. It was great getting to the end of your story, to read that you were going home. You’ve hit some “frost heaves”, for sure….but we are hopeful that the road will turn smooth again soon. Get your strength back at home, and absorb all the love that is present there. Pat and Will, a nice dinner, good music and a fire going. Home! so glad you’re heading home, the bad levels hitting the down-ward spiral and the appetite the other direction! Hoping for good results on Tuesday and a constructive path forward. Anja, (Linnea waving back to Otto from her rocking chair), I love you and miss you and am hoping your new little blip is nothing. Hi Linnea- We are very happy to read that you are on your way home. Home is a much better place to heal than any hospital room! Our prayers and thoughts are with you and your family. I keep youin my heart and in my prayers. Lorraine, I already sent you a (whiny) email in response to one of your questions. I am prozacless and will likely stay that way, although it is doubtful it was a major player in the liver injury. I just feel sort of ‘scared straight’ in regard to any additional drugs at the moment. I remember our little session in the bar with fondness too. At the moment, I don’t believe I could even look at a glass of wine. That shall, I’m sure, pass. Keep me posted as to what you learn at the forum, and I will be in touch. Oh, Linnea… I’m sorry you had to stay in the hospital, but glad to hear you got out very quickly. I am myself having a bad case of either a head cold or hay fever but am trying to withstand it without taking any medicine for it. After all, we’ve been taxing our livers quite a bit with the strong cancer drugs. Let’s be kind and gentle to our livers. Do you know the Qigong practice of smiling to your organs? You touch the area of the body where the organ is and smile to it, thanking the organ for its work. I know it sounds silly but there are people doing it very seriously to keep their organs happy! Smile to your liver (and to your lungs, of course)! Yuki, I love it! When I was trying to write my post I kept typing lover instead of liver (just like I’ll sign a note live when I mean love). So, I’m going to give it a try. Best of luck with that cold, but don’t suffer too much. Sometimes a bit of medicine can really make it all better. I’ve been praying for a quick recovery for you and happy that you are on your way home. It’s a long hard journey some days. I’m so glad you have such a wonderful doctor. It makes all the difference, doesn’t it? Sara, thank you. I caught up on your blog just a bit ago; I kept reading sentences out loud to my husband and saying, ‘see, everything sounds better in southern!’ Anyway, I am sorry you did not turn out to have an ALK mutation, but I am wondering if anyone spoke to you about the possibility of having a ROS-1 mutation? As you rule out one, another becomes a possibility. Anyway, I wish I could see your new curls and good luck with that upcoming scan. I just recently became aware of that new mutation. I will ask my doctor about it at my next visit. Is Dr. Shaw running any studies that would do the testing? I could also contact my friend at the Cleveland Clinic and see if they can do it. Sara, they have a clinical trial going at MGH for ROS-1 positive patients–using crizotinib. So yes, I am certain you could get testing done there. Let me know if I can be of any help if you decide to look into this further. Until now, have not blogged with those of you sharing the non-smoker, NSCLC experience but today I decided to offer what I can and learn what all of you have to tell me. I responded to Robin’s posting on treatments of brain mets and your comment that LDK378 may be effective in the brain because as far as I know, I am the one patient with brain mets on the drug and my scans after 3 months showed improvement on the MRI. It is way too early to claim any significant success (I’ll have another MRI in 6 wks) but if this is true, it is a major advance for many of us who have too many lesions for SRS. I told most of my story on that posting but I wanted to respond re your liver toxicity because I have had the same experience with LDK378 and wonder how many others have the same. I am in the trial at UC Denver with Dr Camidge and he told me about your hospitalization reported on this post. I started the trial last fall after developing resistance to crizotinib and my ALK phos started to rise gradually after a couple of months on 400mg/d and reached about 1100 5 weeks ago. ALT and AST also increased but not so drastically. Bili remained normal. It is interesting that your ALK phos was not affected. I stopped the drug for 1 week, values all started coming down and I restarted the drug at the same dose. Liver enzymes have continued downward with ALT and AST now normal and ALK phos about 300 yesterday. I am now back to having labs done only once a week. I am interested to know if you go back on the drug and what happens with your liver enzymes. I am a physician myself and understand from colleagues that there are other drugs (INH for TB) that cause a transient drug hepatitis which resolves in some patients even with continued therapy. Are we seeing the same phenomenon here? No one knows. I understand from Dr Camidge that he and Dr Shaw will be having discussions this week so hopefully, they will come up with some answers for us. Gene, thank you for (both) your comments–I let Robin know about the other and she responded to you in that post. It is fantastic that your brain mets have responded to the LDK, as that is crizotinib’s Achille’s heel. How interesting to hear that you had a similar experience to mine. A bit unnerving, no? I’m glad you were able to get right back on trial–at a week my ALT is about 350. The plan is for me to go back on, but likely at 400mg again, not 500. I have ben told that I need to get my enzymes back to normal before I can do so. I like the fact that our two (esteemed) doctors will be talking about our situation together; maybe they can shed some light on why this didn’t happen initially, but only later (cumulatively). I wish you the best of luck, and please stay in touch. We seem to be on similar paths. Good to hear back from you. Interesting that your ALT went much higher than mine but I had the extremely high alk phos. I’ll try to talk to an internist friend about what all of this might mean. I am a dermatologist so not much help in this area. I hope to stay on the 400 mg dose to help with brain penetration but it sounds as if 500 may be pushing things a bit far for toxicity. Nausea and loss of appetite are my 2 biggest problems. I find it easier to drink Ensure and Carnation Instant Breakfast than to eat meals. Do you have any other helpful hints? Gene, the handful of folks on LDK that I have communicated all complain about the GI challenges. Several of us started taking it before bed, rather than early in the morning, so as to sleep through the worst of it. However, then I would awaken with a stomachache. I tried to describe to Alice how I felt crampy and gaseous in both my lower GI (sometimes resulting in diarrhea) and upper GI–resulting in occasional nausea and vomiting. I did find that slicing up some fresh ginger and steeping it in boiling water helped some with the nausea. Maybe when the protocol changes so that it cam be taken with food (and some of us have found we already have to at times in an effort to combat nausea) it will get better. Hello, I want to ask whether you have conquired the liver enzyme problem yet? My mum has the same elevations with Xalkori. Currently seeking solutions. John, sorry to hear your mom is dealing with elevated liver enzymes. In both cases it was time and a vacation from therapy that healed my liver. Of course, I am more careful now about even over-the-counter meds that might affect liver enzymes, and certainly alcohol as well. Best of luck to your mom.